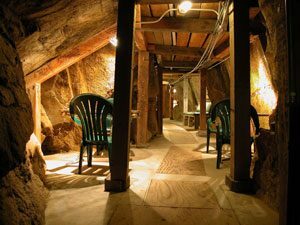 In Montana, at the Free Enterprise Radon Health Mine, radon therapy takes place in the underground “gallery” or at surface in the “radon room” – or a combination of both. The difference is only that which is most comfortable to the individual. Testing confirms radon levels averaging about 1700 pC/l of air – with normal fluctuations ranging from 700 to 2200 pC/l of air. Exposure to radon is perfectly safe at just twice the amount of natural background radiation one might receive on an annual basis. Visitors “self-treat” via a series of daily visits to the Mine. An average stay includes a range of 30-60 hours over a 10-day stay. Your visit schedule will be determined by factors that may include severity of disease, mobility, energy, level of pain, and time or travel constraints. Shorter stays are allowable. You may repeat therapy as needed. Most visitors report positive results that range from immediate to weeks later, lasting months to years. The underground gallery is 85′ below surface and accessed by a well maintained and licensed Otis elevator. Amenities include tables, chairs, and heat lamps over padded benches. Flooring is level and dry. Temperature averages about 54F – 58F. Wear warm, comfortable, casual clothing and footwear. Bring a blanket and/or pillow if you like to sleep. Restrooms are located at surface only. Care givers must be readily available for assistance. The radon room at surface is an alternative to going underground. Radon-laden air is pumped up from the 105′ level of the mine workings, circulated and returned underground. Pets may take therapy at surface in kennels exposed to radon-laden air yet separate from the radon room. Bring a blanket and toy. Pets must be manageable and on leash at all times.